Two Short Films: Coda (2014); Umshini Wam (2011). I seem to be finding so many amazing short films lately. Here are two that I watched recently, which are very different stories – one, an Irish animated short about life confronting death, and the other, a gangster story about two badass South Africans, directed by Harmony Korine. Getting it out of the way, before I say anything else: I love this short film. 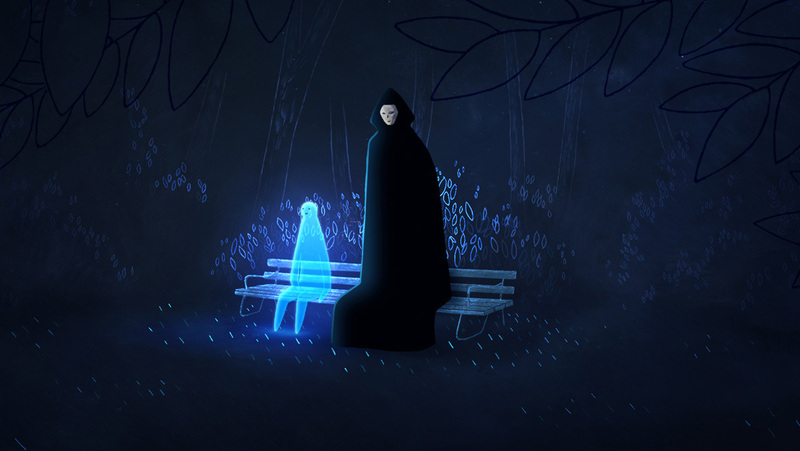 Coda is an animated short that speaks of life and death, and the very human instinct to cling on to life when death feels imminent. As a lost soul wanders through a city and a park trying to bargain with death, death shows him things about life before it’s his time to pass on. This short film is beautiful and tender despite the generally macabre theme. Its animation is simple but so expressive, and the gorgeous piano and string music throughout is very stirring. Some of the animation reminded me of another Irish film, The Secret of Kells (2009), with the almost geometric patterns and delicate detail. Coda is an almost surreal experience to watch, and it makes you think really deep thoughts afterwards. Highly recommended. Directed by Harmony Korine, Umshini Wam stars Ninja and Yo-Landi Visser of the outspoken South African rap duo Die Antwoord, who recently also starred in Neill Blomkamp’s Chappie (2015). It’s a short story with a lot to say about people who are stuck in their present life situation and seek personal improvement. In this case, Ninja and Yo-Landi are two charming people who roll about on wheelchairs (despite being able to walk), and who want to be better gangsters as people don’t take them seriously. The short film overall feels like a tale of people who want more in life, even if it’s the little things like awesome wheels for your wheelchair, but with a murderous twist. Shot in typical Harmony Korine style, with a focus on a decaying landscape contrasted with bright colours and booming music, Umshini Wam reminded me quite a bit of Spring Breakers (2012). If you’re not a fan of Korine’s style you won’t like this at all. But I thoroughly enjoyed it, even though it is quite bleak. I hope you enjoyed Coda as much as I did! I enjoy Die Antwoord but they are really not for everyone! Still haven’t seen Chappie because everyone said it was not so great. Maybe they are more tolerable in smaller doses! These look great, with the added bonus that I’ll probably make it the whole way through without falling asleep, haha! I know that Korine tends to divide opinion but I’ve always been in the ‘yes’ camp, just because he always seems to bring a different viewpoint. That’s my favourite thing about short films – you don’t get the chance to accidentally fall asleep! Especially with engaging shorts like these ones.